President Trump’s Proposed Budget – Winners and Losers! Here at My Rural America, our priority is to make the decision-making that goes on in Washington, DC personal to our readers. With this inaugural website release, we begin by sharing the chart below. It was first released by Congressional Quarterly’s Roll Call newspaper on Tuesday, February 13, 2018. 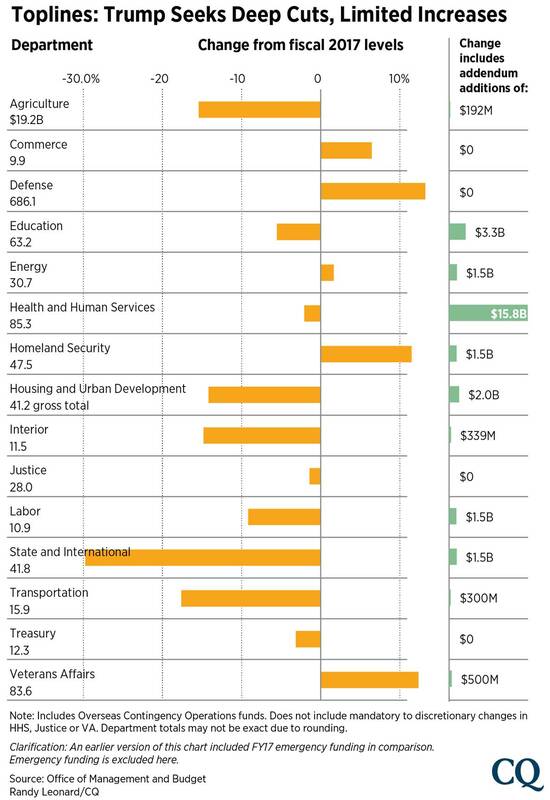 The data is based on the Trump Budget as calculated by the Office of Management and Budget (OMB) which reports directly to the Office of the President. Cuts nearly $45 Billion from the Farm Safety net, including cuts to US commodity programs, crop insurance and conservation programs. At My Rural America, we believe that the USDA Farm Safety Net does more than just protect individual producers; rather, it adds stability to the US (and the World’s) food supply, and it protects Rural America’s most important asset – our water and land. We also believe that feeding programs for the hungry – no matter where they live, result in people who are better prepared to learn, work, and maintain their health. Note: these cuts are not for balancing the budget. Rather, the Congressional Budget Office estimates the budget results in a $720 billion deficit in 2027, with debt in that year reaching 80 percent of GDP.